Rev. 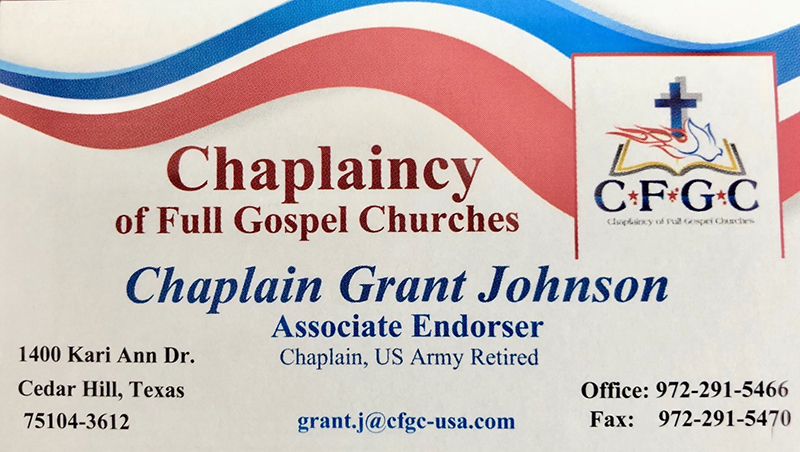 Grant E. Johnson is the Associate Endorser for Chaplaincy of Full Gospel Churches, Inc. He is recently retired as an U.S. Army Chaplain, Lieutenant Colonel (LTC). Chaplain Johnson received a Master of Divinity Degree from the Assemblies of God Theological Seminary in Springfield Missouri in 1987 and a Bachelor of Science Degree in Education from Indiana University of Pennsylvania in 1977. He is ordained by Kingsway Fellowship International in 1989 and endorsed by Chaplaincy of Full Gospel Churches since 1989. 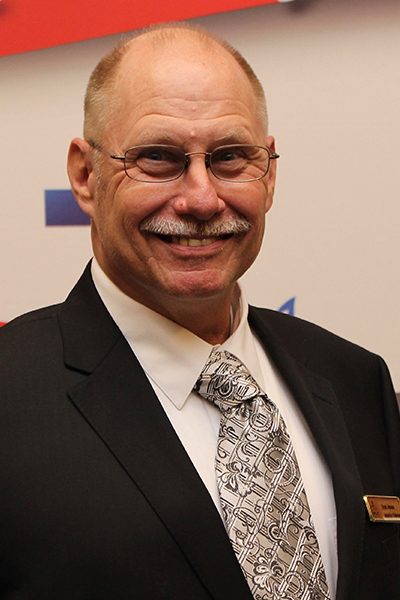 Chaplain Johnson served as a Volunteer Police Chaplain, worked in Associate Pastor responsibilities and provided Volunteer Hospital Ministry in Springfield, Missouri from 1985 to 1991. As a Volunteer Police Chaplain he dedicated two weekends a month to crisis and patrol ministry. As a Hospital Volunteer Chaplain he responded to after hours crisis events at Cox Medical Centers in Springfield Missouri. He was a Licensed Minister with the Assemblies of God Churches in 1985 in the Southern Missouri District leaving in good standing under God’s divine unction which moved him to change his endorsement to the Chaplaincy of Full Gospel Churches in 1989. Chaplain Johnson began his Military Chaplaincy experience in 1985 with a Commission as a 2nd Lieutenant, as a Chaplain Candidate in the Missouri Army National Guard. His first units were with Army National Guard in Missouri with the 35th Divisional Support Command (DISCOM), 35th Division in Lexington. In 1989 he was accessioned and selected to be a Chaplain in the Missouri Army National Guard as a 1st Lieutenant serving in the Main Support Battalion, 35th DISCOM, 35th Division. He completed all phases of Chaplain Officer Basic Training in Fort Monmouth New Jersey in 1986 and 1987. In January 1991, during Desert Storm, Chaplain Johnson began his active duty Army Career in Schweinfurt, Germany. His military service included time with 5 Divisional assignments. He was a Chaplain Observer Controller, at the Combat Maneuver Training Center in Hohenfels, Germany. He completed U.S.Army military education in the Chaplain Officer Advanced Training, the Chaplain Brigade Course, the Chaplain Lieutenant Colonel Course, the Chaplain Resource Management Course, the NATO Chaplain Course and the U.S. Army Command and General Staff College. His previous military positions and assignments include: Deputy Garrison Chaplain, Fort Hood, Texas; Deputy Command Chaplain United States Army Europe, Heidelberg, Germany; U.S. Army NATO Chaplain, Schwetzingen, Germany; Installation Chaplain, White Sands Missile Range, New Mexico; Chaplain Resource Manager, Schofield Barracks, Hawaii; Deputy Division Chaplain, 1st Cavalry Division, Fort Hood, Texas, and Iraq; Garrison Chaplain, Fort Bliss, Texas; 2nd Infantry Division, Division Support Command Chaplain, Tongducheon, Korea; 101st Air Assault Division, 501st Signal and 3rd-502nd Infantry Battalion Chaplain, Fort Campbell, Kentucky; Chaplain Observer Controller and 1st Battalion 4th Infantry Regiment (OPFOR) Chaplain, Combat Maneuver Training Center, Hohenfels Germany; 3rd Infantry Division, 2nd Battalion 64th Armor Chaplain, Schweinfurt Germany; 35th Infantry Division Support Command and Main Support Battalion Chaplain and Chaplain Candidate, Army National Guard, Lexington and Poplar Bluff Missouri. Chaplain Johnson is married to the former Margaret J. Davis and they have three adult children, Benjamin, Stephanie and Nathanael. Chaplain Johnson’s military awards include the Legion of Merit, the Bronze Star, the Meritorious Service Medal (9 OLC), the Army Accommodation Medal and the Army Achievement Medal. He also was awarded the Order of Titus and the Order of Saint Barbara for his distinguished service.